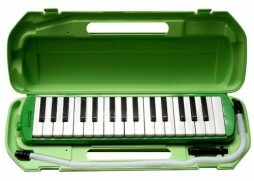 32 KEY MELODICA COMES WITH HARD CASE, HANDLE. INCLUDES TUBE MOUTHPIECE, AND STRAIGHT TUBE MOUTHPIECE. BUILT IN HAND STRAP. AIR RELEASE BUTTON.